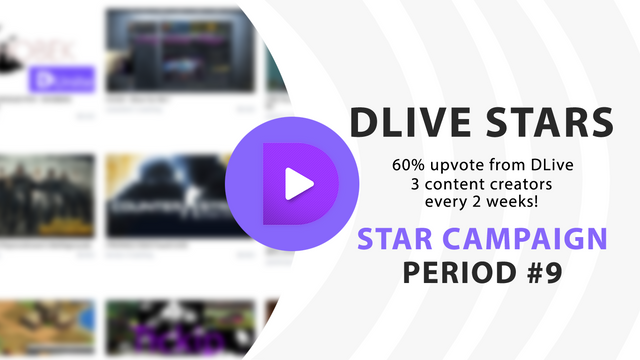 The start of the 10th DLive Star Campaign will be announced in a separate post, at a later date. Alphasteem is one of the many video content creators on DLive. Her high quality, diverse content and viewer interaction is what makes her a DLive Star. Make sure you follow her to see some of her vlogs, cooking & baking videos! Vectorabbot is an extraordinary broadcaster. He does a great job engaging with his audience while playing a wide variety of gaming titles, such as Far Cry, Zelda and Batman! The-OraCool mainly live streams FortNite, but more importantly all his streams are entertaining and engaging. He manages to keep his viewers watching by always keeping it exciting, for example, trapping his duo's teammate in FortNite. YEEAAAHH @alphasteem!!! Well deserved accolades! Thank you, alphasteem! Congratulations to you and @the-oracool! Congrats @alphasteem, @vectorabbot, and @the-oracool, you deserve it! Congrats to @alphasteem, @vectorabbot and @the-oracool! Many congratulations to all the winners, they do an excellent job and their contents are very interesting. THIS IS AWESOME! THIS IS LEGENDARY! Congrats to all new DliveStars! Woah!!!! Congrats @alphasteem, @the-oracool, and @vectorabbot!!!! Awesome guys!!!! Thanks, eric! Still workin' on the notifications, brother. Dude, anything you need help with please dont hesitate to reach out.... We will get it! Thanks again, eric! YO - I got it working! @vectorabbot, make sure to get a hold of me on Discord. Thank you for responding, jimmy! I am so grateful, @DLive! Thank you for your support and thank you for this most amazing platform; I have learned so much streaming on DLive from the community and have had a ball doing it! Always looking forward to the next stream and the opportunity to connect. Congratulations to the winners! One of these days, it'll be my name on that list. Just you watch! Awesome Job Ladies & Gents #DLOVE!!! Congrats to @alphasteem, @vectorabbot and @the-oracool! Awesome! Congrats to the Dlive Stars for this round....It's quite an honor and there are so many amazing creators on Dlive right now. Very good boy... Congratulations my friend. A hug from Venezuela. Congrats guys well done! Keep up the awesome work! Big congratulations to @the-oracool @alphasteem and @vectorabbot!! Make sure to dodge the paparazzi at the hotel! @patrice get your downvote bot under control this is flipping PETTY! Very Nice, well deserved! @alphasteem, @vectorabbot and @the-oracool!